If you are looking for a versatile, hardwearing material, outdoor rattan furniture is going to be your new best friend. It'll stand up to all kinds of weather, suits contemporary and traditional garden schemes and is light to manoeuvre around the garden. What's more, with the addition of cushions, rattan is very welcoming. After all, no summer soirée is complete without a comfortable set of garden furniture for relaxing and outdoor dining; this rattan garden furniture selection is our pick of the very best. After you've chosen your perfect rattan set, check out more buyer's guides and visit our garden hub page. Not only does it look smart and modern, but it is known to hold up well all year round, even throughout some of the coldest British winters. 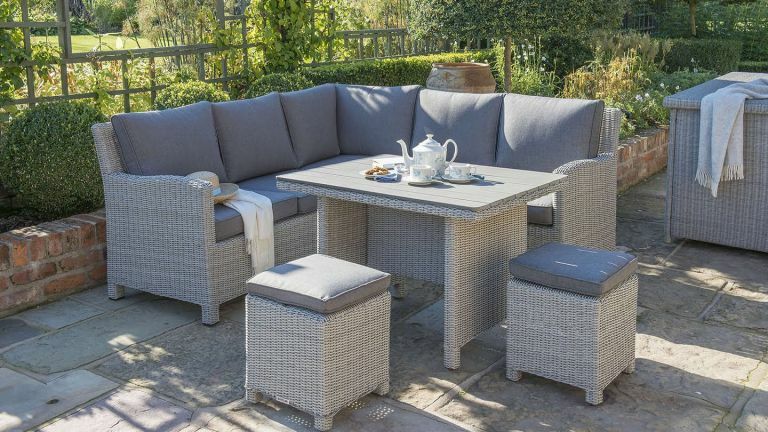 From patio tables to full rattan furniture sets, we’ve picked out some of the best-looking items to kit out your garden this summer. No matter how big or small your outdoor space, the addition of seating or somewhere to eat will instantly make your garden a more accessible place for all the family. Something to consider is where you wish to place your rattan furniture. Have a good look at your outdoor space, and then decide from there. The weaves vary. Modern flat weaves look great in contemporary settings, while a rounded, wicker-style weave is perfect for a traditional feel. In some cases, rattan can be quite heavy, so once its set in place, you’re unlikely to want to keep moving it around. Bear in mind that when placed on a lawn it will affect the grass underneath, so if you have a patio or decking, this could be a better place to position your garden furniture. The other thing to consider is whether your rattan furniture comes with a protective cover – if it doesn’t, you’ll need to factor in the cost of this. Although durable, during the winter and on rainy days when not in use, it is best to keep the furniture covered to preserve it well. With some synthetic rattan, you may be able to keep it outdoors. Rattan furniture makers Maze Living promote investing in synthetic rattan that is waterproof and can be easily cleaned with a damp cloth. Check out our round up of some of the most stylish rattan garden furniture available and get your garden looking fabulous. Then check out more buying guides and visit our dedicated garden pages. If you’ve got a big garden with some space that needs filling, then you may like the concept of this large rattan daybed. It has a funky teardrop design which provides seating for up to four people and curved edges that will protect from the wind. The seating includes the cushions which will need to be taken in when not in use, but the structure itself is UV resistant and weatherproof so it will remain intact all year round. If you’d like to dine outside more this summer, then the Kettler Palma mini corner set is designed to seat up to seven people with ease, allowing plenty of space for friends and family to enjoy your outdoor space. This set has protective caps on the feet, but it is still recommended to place this rattan furniture on a hard surface to avoid ruining your lawn. The whole set, including glass table top, is weatherproof, so it can remain outside all year round. Rattan garden furniture doesn’t have to be confined to the decking or patio. In fact, this hand-woven wicker sofa is a popular choice for kitting out your conservatory with light and airy furniture. Whether you want to use it outdoors in the summer and indoors in the winter is up to you, but it is completely weatherproof and will be happy wherever you choose to leave it all year round. The cushions are included and require keeping dry, and you have two different shades to choose from to suit your home décor. Big families who want to make the most of their garden this summer should find this large dining table and chairs a great way to bring everyone together. The set includes four armchairs and four stools which neatly tuck away when not in use. The parasol also provides much needed shade on those very hot days and the top of the table is finished with tempered glass that can withstand both the heat and cold. Although weatherproof, this set does also come with a weather protection cover, which is recommended for when this table is not in use for a long period of time, such as during the winter. If we’re lucky enough to have some really hot summer days, there’s nothing better than taking a nap in the garden under the sun. This rattan sun lounger will certainly help you soak up some rays with a naturally curved design and adjustable back rest that helps you find the perfect position for sunbathing in. The thick cushion makes things super comfy, but you will need to look after this piece of furniture by bringing it in during the winter. If you’ve already kitted your garden out with rattan furniture, then this patio heater is a nice addition that will allow you to enjoy it through into the evenings when the sun has gone down. The patio heater is powered by gas and features an auto shut off safety feature. It has an aluminium frame but is coated with rattan to make it both stylish and practical. It’s a little heavy but it’s freestanding and can remain on your patio all year round.